As it turns out, sleepy little Plettenberg Bay isn’t really sleepy after all. I boarded the plane. The flight attendant gave me a beer. I had to down it immediately, because we were landing. My journey from the office to Cape Town International, at 40 minutes, had taken longer than the flight to George. Now, it was off to lovely, colonial-style Lairds Lodge Country Estate, tucked away down a dirt road off the N2 just before Plettenberg Bay. It was my first time in the little resort town, originally called Bahia Formosa – ‘Beautiful Bay’ – by the Portuguese, and I had plenty of adventures ahead of me. Night one served up canapés and wine at the launch of The Plett Trail, a new luxury slackpacking trip devised by Plett Tourism, after which an early start meant an early night. The following morning, with a packed breakfast courtesy of the lodge, we set off for Storms River Village. 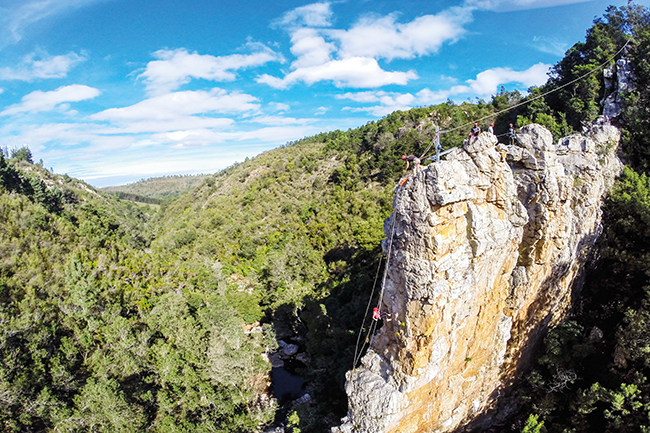 It is a straight shot east along the N2, across several gorge-spanning bridges – including the 216m-tall Bloukrans Bridge, the highest in Africa and home to one of world’s highest commercial bungee jumps. 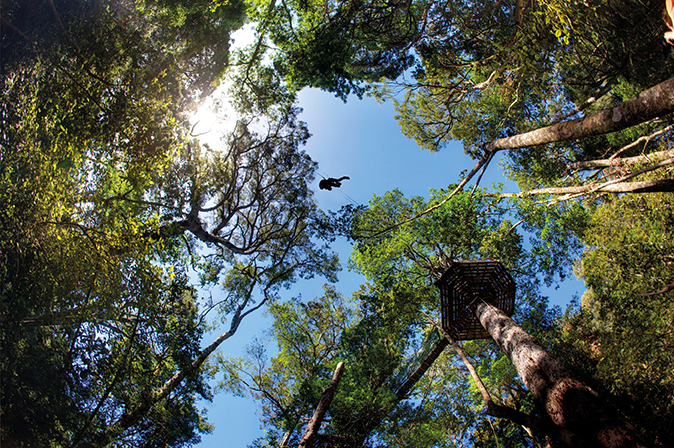 We were heading for something less terrifying, though: the Tsitsikamma Canopy Tour, a zip-line jaunt through the lush, primal forest. There are 10 stretches; the longest is 100m long and carries you 30m above the forest floor. It was exhilarating and, thanks to guides Luyolo Kotsana and Mandy Louw, fun and informative too. Also – and this is true of everyone we encountered – they seemed to really love what they do and where they get to do it. After a quick stop to look at classic cars and bikes at Marilyn’s 60’s Diner in Storms River – something straight out of Grease – we headed into Plett for the annual Wine & Bubbly Festival. After tasting plenty of good wine from all the farms in the area, assembled in a big marquee at Central Beach, we decided to explore a bit. The festival featured performances by Arno Carstens and Wendy Oldfield, among others, as well as some great modern street food from eateries in the area. We walked on the beach for a while, then took a slow drive to Nature’s Valley and back, before collecting some pungent cheese, biscuits and accompaniments, and returning to the lodge, where we sat on the verandah gazing out on a moonlit pond and listening to what sounded like hundreds of frogs all trying to get the last word in. The next morning was rapidly approaching, so we turned in for our last night at Lairds Lodge. After 15 minutes spent stretching, squeezing and cursing, I was wearing a wetsuit. I bore an alarming, if not altogether unexpected, resemblance to a sea lion who’d let himself go over the past few years. And was now wearing a wetsuit. The drive from Plettenberg Park Hotel & Spa, our new base just outside of Plett, to Storms River Mouth was an uneventful one, save for my frequent gasps and exclamations about just how beautiful and/or green everything was. I was about to embark on a kayaking adventure up the deep gorge the Storms River has slowly worn into the imposing surrounding quartzite. It’s a 10-minute walkway-stroll through the forest to where the kayaks are, and not awfully strenuous, even in a wetsuit. The trip usually includes some time out on the ocean, but it was much too choppy on the day. The turbulence disappeared about 100m upstream from the kayak dock, though, when we found ourselves in a very deep, perfectly calm natural harbour – the same one used by earlier explorers of the region. Against a stiff breeze, we paddled on, flanked by stone walls up to 150m high, until it calmed even more and we switched to lilos and took it down a notch. I drifted along under sprinkly little waterfalls, attempting to figure out the logistics of building a house in the gorge. A bit further upstream, we abandoned our lilos, climbed over big boulders to the next pool and had a bit of a swim and a lie in the sun before heading back. Dinner was at The Table Restaurant & Bar, in Plett itself. If you like pizza and beer, among many other things, it’s the place to go. Great food, great service and a great place to watch England play their hearts out knowing they’re out of the Rugby World Cup either way. It was my first time abseiling, as I’m usually averse to flinging myself off high objects. But this? Hanging from a rope 50m above the stream below, with an amazing view up and down the valley? This was cool. This I could do again. It’s all very safe, too. They have a via ferrata, Italian for ‘iron road’ – basically cables and rebar steps hammered into the rock – that you remain attached to at all times en route to the stone finger you abseil down. The climb back up the bank is a steep series of steps, which would’ve been fine, except I’m about as fit as Danny DeVito. Still breathing like an asthmatic bear, I met Joy, my horse for the afternoon. From Hog Hollow Country Lodge, she carried me slowly through fields and old forest, through dells and over crests, with dappled sunlight filtering though the leaves. The trail took us through the vineyards to Bramon Wine Estate, where owner Peter Thorpe gave us a taste of the good stuff: a pure Sauvignon Blanc MCC. As far as we can tell, no one else makes one, anywhere, so it is definitely a wine to try. After tasting the rest of the range, we rode on through more vineyards to meet Doug and Sue Lund at Newstead Wines, getting a bit of a trot in along the way. Here, we were poured more great bubbly by Doug and fed the ideal summer meal by Sue: salmon and pancakes, prosciutto-wrapped figs, goat’s-milk-cheese salad, cheeses, cold meats, beetroot hummus, caramelised pears… I felt sorry for my horse on the way back to Hog Hollow. But Joy didn’t seem to mind, happily breaking into a trot a few more times. 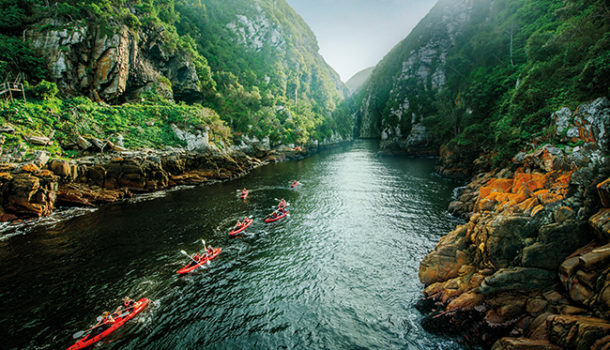 Plett Tourism recently launched The Plett Trail, a nine-night, ten-day slackpack through the area surrounding the town. Besides hiking or walking, nearly every day offers either wine tasting, lunch at a fine restaurant, or both. On top of that, you’ll have picnics, horse rides, a visit to a Stone Age archaeological site, birdwatching, a raptor display, ecology talks, a choir and dancers, and a gallery visit. Dinner, bed and breakfast are at a selection of the finest lodges and hotels in the area, including Lairds Lodge Country Estate, Emily Moon River Lodge and the Kurland Hotel. And slackpacking, of course, means that you won’t have to carry all your luggage around and can more fully appreciate your magnificent surroundings. 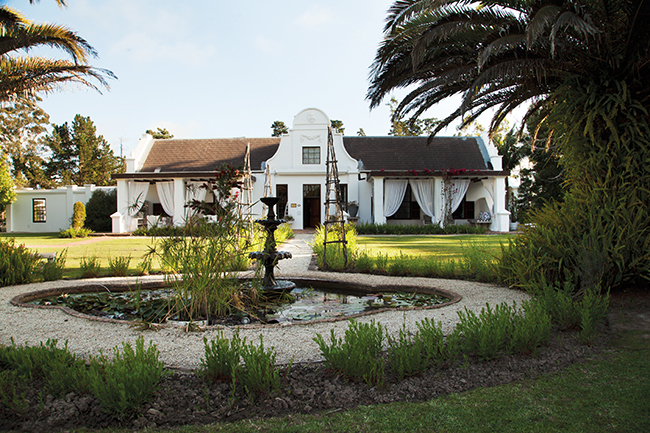 For a rich, colonial-style lodge experience, try Lairds Lodge Country Estate (www.lairdslodge.co.za), tucked away down a dirt road just before Plett. With beautifully appointed rooms in the most serene setting, you can’t help but relax. If you want a spectacular view of the sea, though, Plettenberg Park Hotel & Spa is difficult to beat, having been built on top of a cliff looking straight south (www.plettenbergpark.co.za). There are many other options available, whether you prefer five stars or five people sharing a dorm with you. 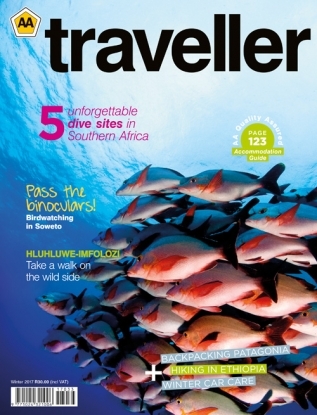 Go to the Plett Tourism website (www.plett-tourism.co.za) to find out more. I only had a short time for this Plett adventure, but there is obviously much more to see and do. That said, I would definitely recommend trying everything I did this time. Visit www.africanyon.com for abseiling, as well as kloofing, canyoning and natural waterslides. For the canopy tour, or to book a team-building event, go to www.stormsriver.com. For a great day above or below the waves, visit www.untouchedadventures.com – they also offer scuba classes if you want to learn. And, for the horse ride, go to www.horseridinggardenroute.com. Most of their animals have been rehabilitated there after being found in poor conditions, so you know it’s a good thing you’re supporting too.